With so many people downsizing into smaller homes and condos, home storage ideas are essential. Fortunately there are many ways to maximize space and create storage areas in even the tiniest of homes. Here are a few ideas for finding practical storage solutions in your home. To avoid feeling cramped in a small space, some hidden storage areas are a must. Create storage with built-in window seats. Conceal the storage area below a comfy padded lid. Use furniture with hidden storage. Pretty storage baskets with lids can be used as extra seating, side tables, or put two together and used as a coffee table. Explore the area under a staircase. If there isn't already a storage area, have one built. It needn't simply be a cubby underneath - pull out drawers and mini closets can be incorporated. Conceal extra hooks on the insides of doors. They can be used for scarves, bags, umbrellas, etc. Floor to ceiling pantries are great in kitchens. Slide-in vertical shelves don't take up much space and provide easy access to all the items contained within. Turn an armoire into an office. You can either purchase an armoire specifically designed to hold office equipment or you can customize the inside of one. Keep your computer, office files, and other work items in it, and pull up a chair when it's time to work. At the end of the day or when guests come by, simply close the doors. Storage space can be found inside the cavity of some construction walls. You may need to hire a contractor to build the storage space, but these areas are excellent space savers in bathrooms or kitchens. Sometimes exposed storage areas are nice as you can keep all your beloved items on display. A wall of built-in bookcases or shelves is a tried and true storage solution. Filling an entire wall provides plenty of room to mix storage and display. A mix of magazine holders, books, decorative objects, and baskets will look pretty and provide space for many treasured objects. If you have trouble keeping things looking neat and organized, add doors to the shelving unit. The wall area running alongside a staircase is the perfect spot to incorporate storage. If the budget allows, have a contractor come in to build shelves in this area. If you like to read while lying in bed, try building or purchasing a headboard that incorporates shelves and drawers. There are plenty of ways to store items while keeping things pretty. Use decorative boxes such as antique lap desks and tea caddies for storing small items such as remote controls, bills and receipts, and other small items. Not only are they great for holding small items, they make beautiful home décor accessories. Use vintage ladders to display jewelry such as necklaces and bracelets. If you have a lot of beautiful jewelry, why would you hide it in a drawer? Ladders draped with beautiful items look great in bedrooms and dressing rooms. They also provide easy access to items you wear everyday. 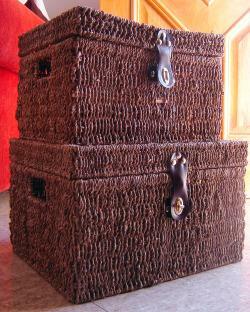 Baskets can be used in every room in the house to store all manner of small items. They work particularly well in mudrooms for storing scarves, mittens, and hats, and in children's rooms for storing toys and crayons. Turn everyday items into display pieces. If you don't have room to store items such as folding chairs, try hanging them on the wall. Paint them a color to match the room and voila - you've got a practical piece of art hanging on the wall. In a kitchen, a lot of space can be saved by hanging a pot rack from the ceiling. If you have nice-looking pots and pans, why not have them out on display? It will free up tons of drawer space. These days everyone can use more storage. Fortunately there are lots of ways to store your items without sacrificing style or space. Try some of the above home storage ideas or come up with your own. All it takes is a little creativity and imagination.